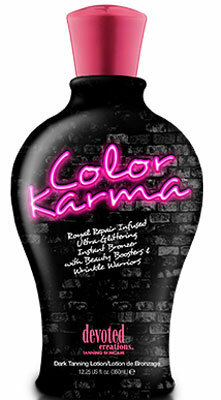 Devoted Creations Color Karma Streak and DHA Free Bronzer -12.25 oz. For those with champagne wishes and caviar dreams, Color Karma is your first class ticket to fabulous! This DHA free ultra-glittering bronzer with super infused flaw fixers will give you that catwalk complexion unmatched by anything on the market. For a beautiful tan that sparkles and shines... Just glow with the faux! Tiger Grass - Color-correcting ingredient that reduces redness and helps protect skin from environmental stress and blemishes. Japanese Rose - Refines pore size while boosting collagen production and reducing excess oil.